East Side Story is a bright blue cream with golden shimmer. Unfortunately the shimmer doesn’t translate on the nail very well. I paired this with Absolut Blue, a perfect blue cream. Both are very pigmented and could be one coaters if you use generous coats. 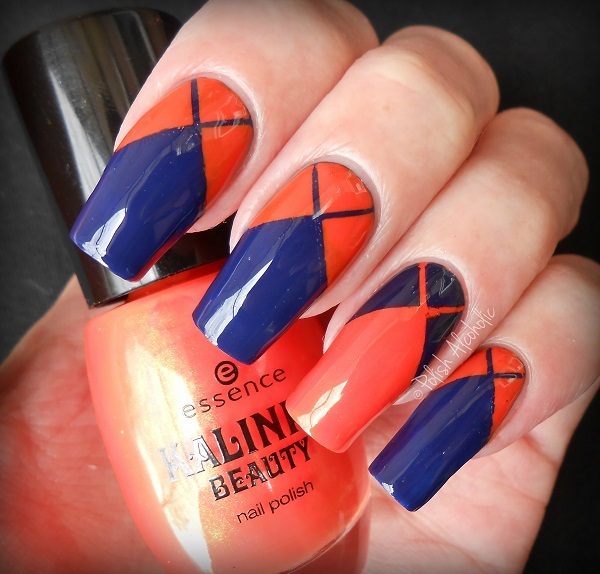 The pattern is inspired by the talented Emily from Very Emily. Lastly From Russia with Love, an apricot frost (!). Ugh, I really don’t like frosty finishes and their ‘hard to work with formula’ *brush strokes everywhere*. The frosty-ness is way more visible in real life than my photo shows. Anyhow, this is two coats plus top coat. What do you think of these? Don’t forget you’ll get 10% off your order when you use code SFX31 at check out! Check out all the nail stickers at Born Pretty Store (worldwide shipping). 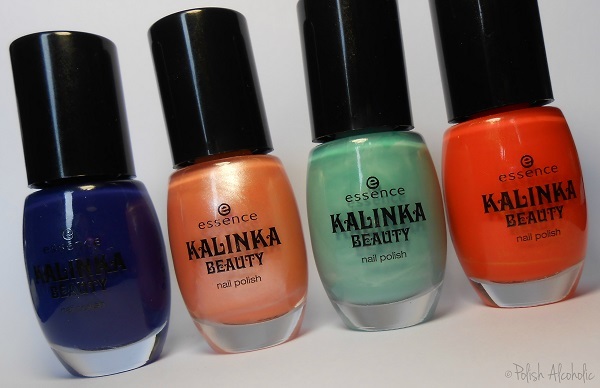 This entry was posted in Essence and tagged blog, essence, essence absolut blue, essence east side story, essence from russia with love, essence green scene, essence kalinka beauty, nagellak, nail polish, review, swatches by Polish Alcoholic. Bookmark the permalink. I love Green Scene with the decals! Very pretty! I like three of them, the last one is horrible.